This is the second Ford cookbook we have featured on our site. 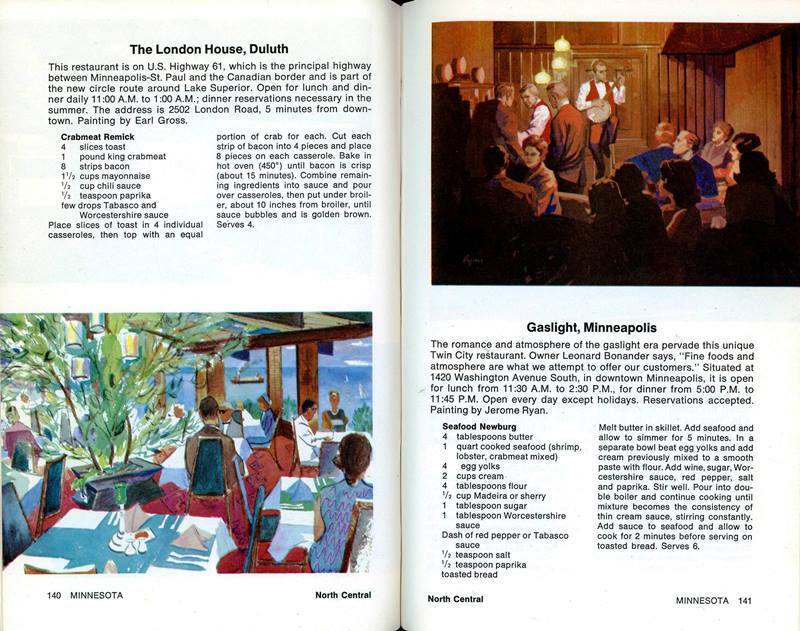 They are part travel guide and part cookbook. 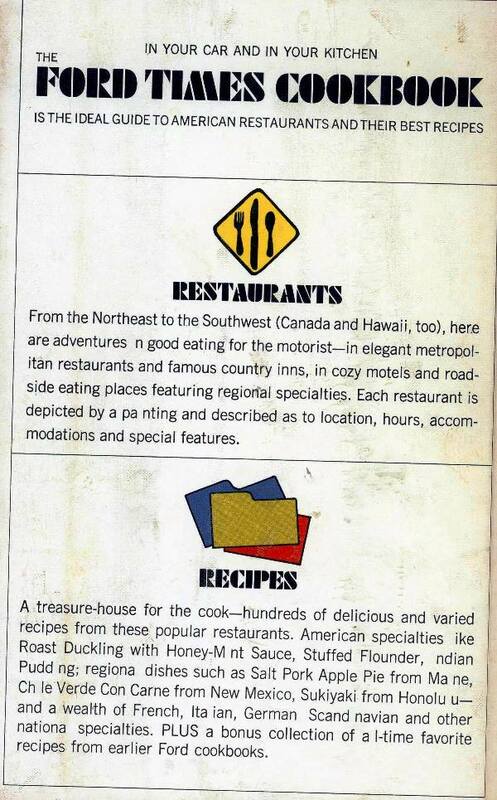 I like these types of retro cookbooks as they also talk about the restaurants. 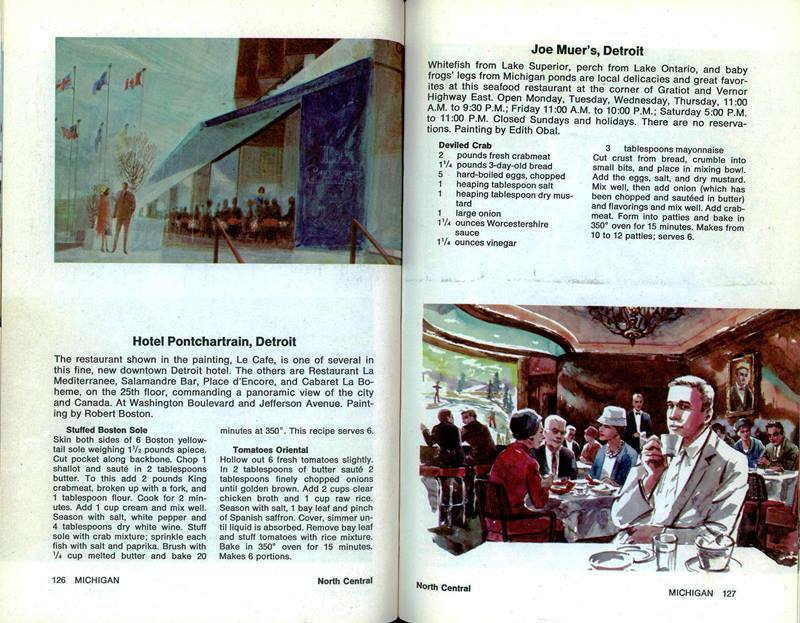 Since restaurants come and go, this is a book that probably should be regularly weeded and updated. However, they are interesting books that deserve some place in an archive. These books are a snapshot of a certain time, and what was considered a signature dish. So keep it for memories but weed it for currency. I’m a Chicagoan and I’d never heard of Simonini’s. (I looked it up: destroyed by fire in 1974.) The Kungsholm is now Lawry’s The Prime Rib. 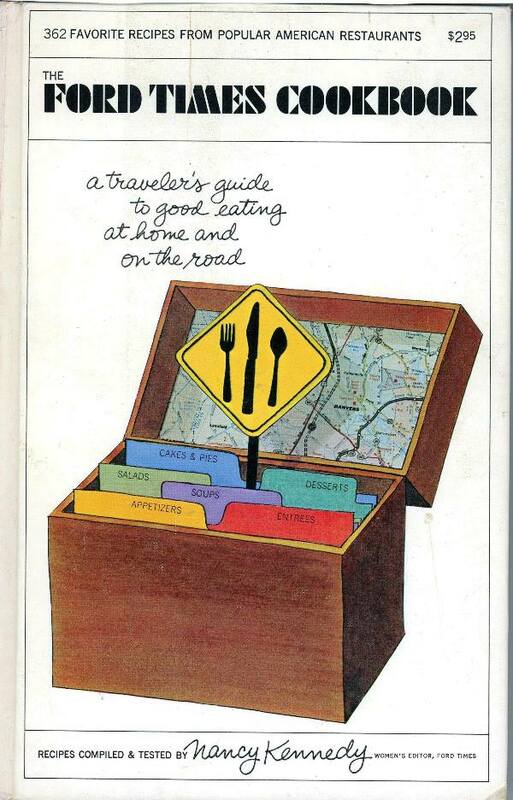 Charley Harper created illustrations for many issues of Ford Times; alas, not for the cookbook. Nann– I think Harper did the illustrations for Betty Crocker’s Cooking for Two, which I’ve occasionally run across. Very fun. Both were landmarks in their own rights. I have several editions of these going back to the fifties. 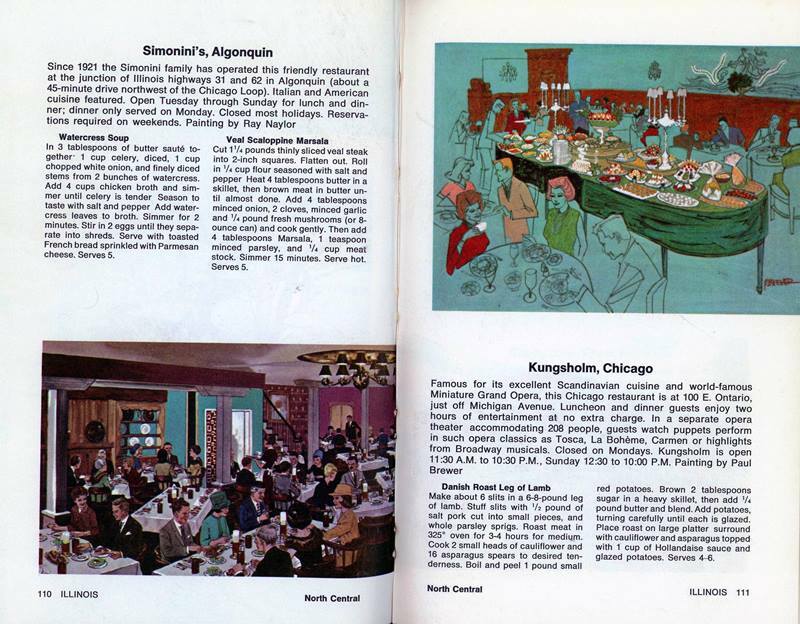 The recipes aren’t too remarkable for the most part but it is so fun to see the old restaurants, especially if you remember them! I’ve even found a few that I’ve eaten at. But really only fun as a nostalgia piece. It would go quickly at the book sale, I’ll bet. Still have a copy of this at home. On the return from my sister’s college graduation in 1971 we ate at Erculiani’s in Gallitzin, PA, which I think was featured in the book. It’s long gone, even the owner’s children have passed on. That watercress soup doesn’t look so bad! But I am bewildered by all these inland restaurants offering recipes for seafood — back in 1968 my mamma (born and bred in New England) lived by the rule of never ordering seafood in a restaurant more than 50 miles from an actual sea. (It’s different now, of course, what with all this flash-freezing and shipping food by air.) Where on earth was a restaurant or home cook in Detroit going to get Boston sole — known here as “flowndah” — with the skin on? Even then, fish was skinned before it was frozen. Mystifying. What is with all the drop-out “i”s and “l”s on the back cover? BTW w/r/t ordering “seafood” too far inland, what about freshwater fish, etc.? Exactly my question. A pretty major mistake by the printer! Freshwater fish is different. Though we get farmed trout and catfish here on the right coast, I’ve never seen a restaurant here offering, say, wall-eye. I have eaten wall-eye in St. Paul, and it was quite good, but I would regard it with — shall we say, a jaundiced eye? — if it showed up in Marblehead. It reminds me of the Food Network Show, Diners Drive-In’s and Dives.